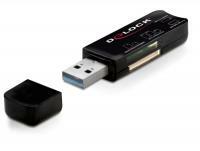 This Delock Card Reader + Hub enables you to read and write memory cards via Micro USB OTG port of your smartphone or tablet. 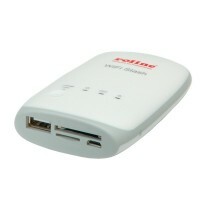 Furthermore it provides three USB A female port thus you can connect e. g. HDD, memory stick, keyboard, mouse etc. 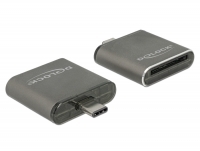 with standard USB A male port to your mobile phone, smartphone or tablet with OTG support. 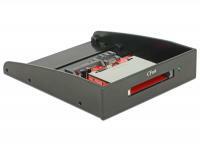 Practical attendant for every notebook user as well as for mini- and desktop-PCs or other peripherals applicable. 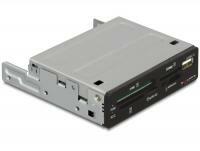 Requirement herefor is a PCMCIA slot. 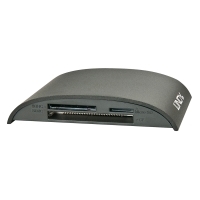 Through plugging the card reader into the PCMCIA slot the card reader is immediately available and the operating system provides a new drive. 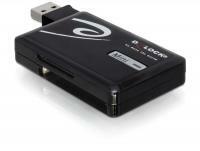 The Delock Card Reader enables you to read and write 57 different memory cards via USB port of your notebook or PC. 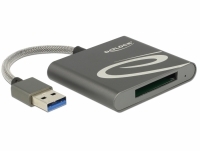 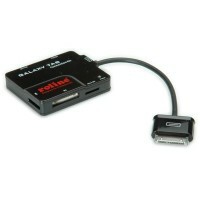 This Delock Single Slot Card Reader reads and writes to the new SDHC and SDXC UHS-II memory cards and allows a very high data transfer rate when connected to a USB 3.0 port. 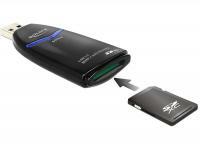 Also SD UHS-I memory cards can be used on this card reader. 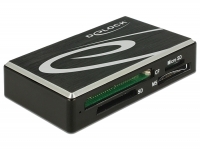 Description This card reader by Delock can be installed into a 3.5″ bay of a PC and will be connected to an internal USB 3.0 pin header male port. 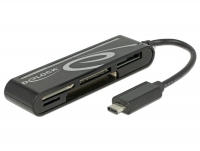 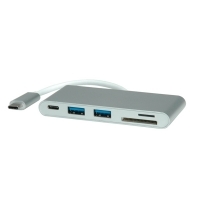 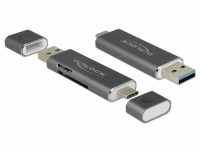 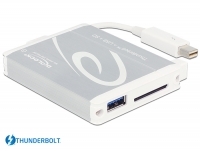 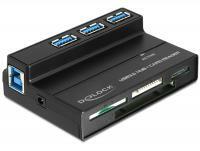 It has a 5 slot card reader and enables the connection of up to four USB devices, which the USB 3.0 hub provides. 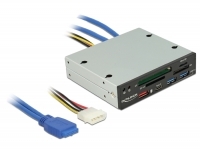 Description This card reader by Delock can be installed into a 5.25″ bay of a PC and will be connected to an internal USB 3.0 pin header male port. 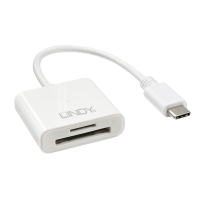 It has a 5 slot card reader and enables the connection of up to four USB devices, which the USB 3.0 hub provides. 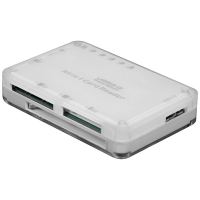 The LED display indicates the current rating and voltage values of the connected USB devices. 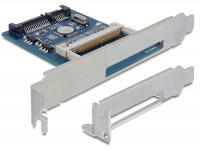 This Card Reader can be installed into a PC slot of a PC and will be connected to a free SATA port of the motherboard. 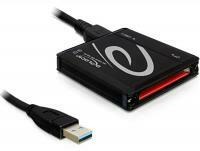 The CFast card works as additional memory as well as a hard drive for an operating system which is also bootable. 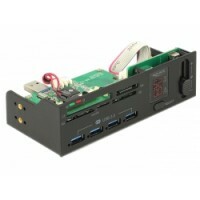 This Card Reader can be installed into a 3.5â³ bay of a PC and will be connected to a free SATA port of the motherboard. 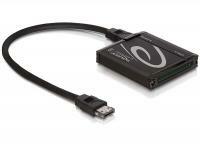 The CFast card works as additional memory as well as a hard drive for an operating system which is also bootable. 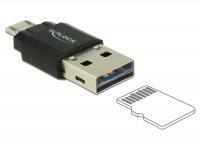 This device enables the connecting of a compact flash memory Card to a 3.5â³ IDE interface. 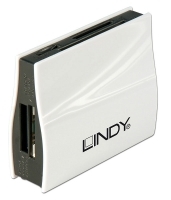 The optional CF card works as additional storage space, as well as HDD for an operating system since you can also boot from it. 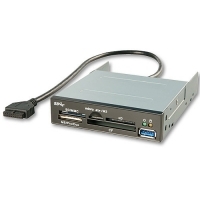 This card reader can be installed into a 3.5â³ bay or a PC slot of your PC and will be connected to a free SATA port of your motherboard. 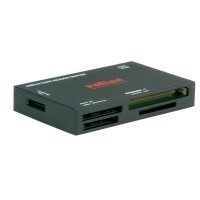 The Compact Flash card works as additional memory as well as a HDD for an operating system from which you can also boot. 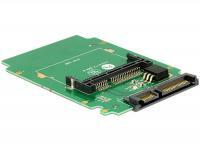 This internal Delock Compact Flash to SATA board enables you to connect a CF card type I/II and Microdrive, which can be used as a hard disk. 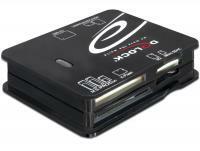 The CF card works as additional storage space as well as HDD for an operating system from which you can also boot. 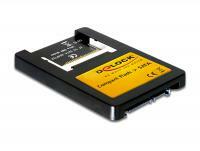 This Card Reader by Delock can be used for application of your CF memory cards. 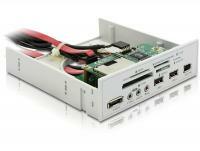 It can be installed internally to your PC via SATA port. 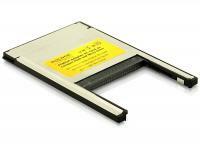 The optional CF card works as additional storage space, as well as HDD for an operating system since you can also boot from it. 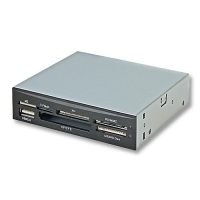 This internal Delock 2.5â³ Compact Flash to IDE drive enables you to connect two CF card type I/II and IBM Microdrive. The CF card works like an additional storage space, as well as a HDD for an operating system from which you can also boot. 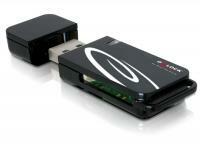 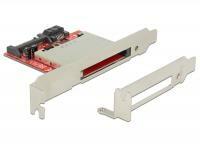 This Delock Card Reader can be installed into the 3.5â³ drive bay of your PC. 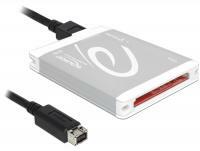 Besides its classic function it offers you one Power Over eSATA port, one USB 2.0 port, one FireWire port as well as one HD-Audio input and output. 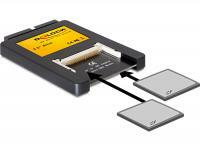 This Card Reader by Delock can be used for application of your SD memory cards. 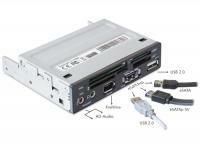 It can be installed internally to your PC via SATA port. 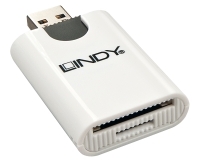 The optional SD card works as additional storage space, as well as HDD for an operating system since you can also boot from it. 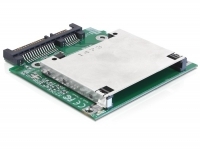 This Card Reader can be installed into a 3.5â³ bay or a PC slot of your PC and will be connected to a free SATA port of your motherboard. 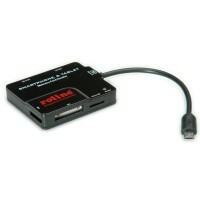 The CFast card works as additional memory as well as a HDD for an operating system from which you can also boot. 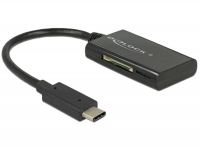 This Delock card reader can be connected to a free USB port of your notebook or PC. 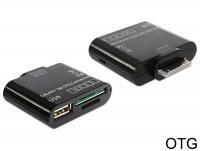 It enables you to read and write a CFast memory card. 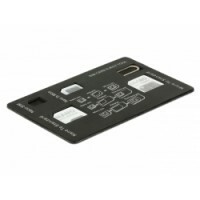 This internal Card Reader can be installed into a free slot of your PC case or without slot bracket internally as card reader board. 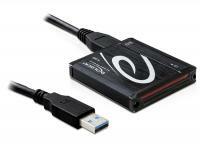 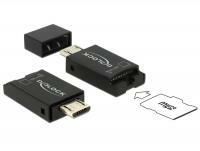 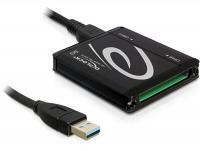 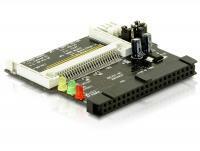 It enables you to use a Compact Flash card via an SATA interface. 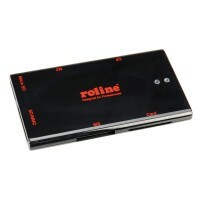 The optional CF card works as additional storage space, as well as HDD for an operating system. This Delock Card Reader can be connected to a free FireWire B port of your notebook or PC. 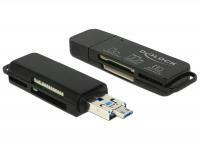 It enables you to read and write a Compact Flash memory card. 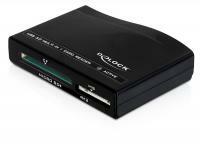 This Delock card reader can be connected to a free USB port of your notebook or PC. 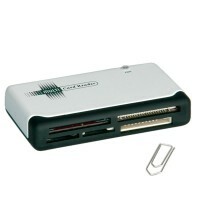 It enables you to read and write a Compact Flash memory card. 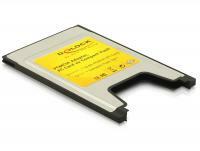 This Card Reader by Delock can be used for application of your CFast memory cards. 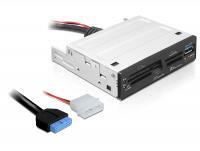 It can be installed internally to your PC via SATA port. 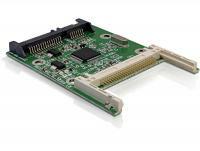 The optional CFast card works as additional storage space, as well as HDD for an operating system since you can also boot from it. 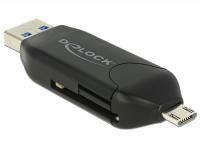 The Delock Card Reader enables you to read and write 40 different memory cards via USB port of your notebook or PC. 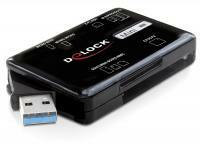 The Delock Card Reader enables you to read and write 63 different memory cards via USB port of your laptop or PC. 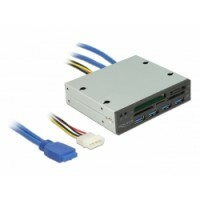 This Card Reader by Delock can be installed into a free 3.5 bay of your PC and will be connected to a USB 3.0 pin header port. 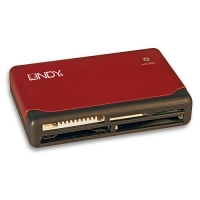 This card reader can read and write 63 different memory card formats. 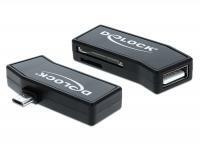 This Delock Card Reader enables you to read and write memory cards via Micro USB OTG port of your smartphone or tablet. 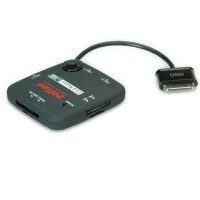 Furthermore it provides a USB A female port thus you can connect e. g. HDDs, memory sticks etc. 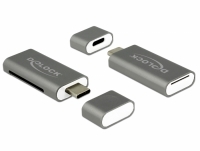 with standard USB A male port to your mobile phone, smartphone or tablet with OTG support. 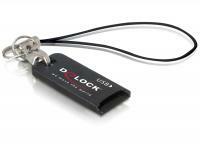 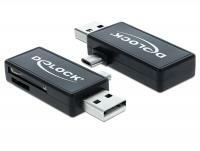 The Delock Card Reader enables you to read and write memory cards via Micro USB OTG port of your tablet or smartphone. 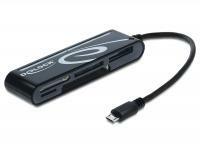 This Delock card reader enables you to read and write memory cards via Micro USB OTG port of your smartphone or tablet. 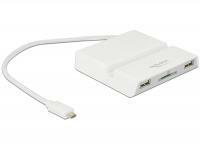 Furthermore you can use the card reader through the USB A connector on your PC. 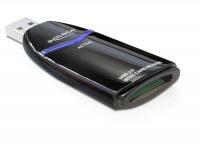 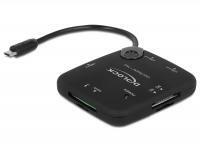 This Delock Card Reader enables to read and write memory cards via the Micro USB OTG port of a smartphone or tablet.